I had a recent weekend full of Pinterest craft projects! First, I used an inexpensive storage bin to create a craft ribbon holder. For my hair clips that I make (shameless plug), I use a lot of different colors of ribbon. 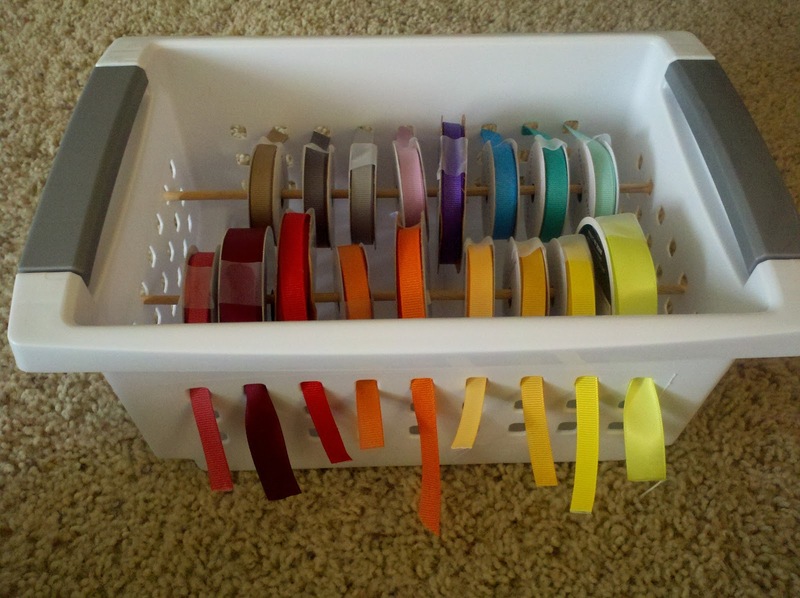 I was finding myself in need of a good way to store all the spools, when I came across this great idea. I measured the holes in the basket, and bought a thin, wodden dowel at the craft store, to cut into sections slightly wider that the bin. I fed these though a couple rows of the holes, and hung the ribbon spools. Next, I saw the idea to use tera cotta pots to make a cake plate-style piece to hold soap and toiletries on the bathroom counter. I bought a terra cotta pot the height that I wanted my final piece to be. Then, I also got a terra cotta plate/dish that was the right width I needed. I painted the pieces first, a fun, bright yellow. I then used a metallic copper and matallic silver (leftover from this project!) paint to accent and 'antique' the piece, to give it some character. Once dry, I attached the two pieces with Gorilla Glue, using the tutorial found here. Voila!! 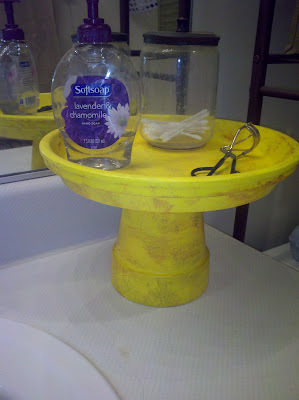 Cake stand turned bathroom counter storage. 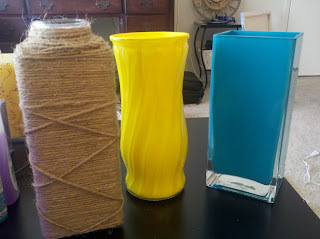 Finally, I had several clear glass vases that were a bit tired and needed some sprusing up! They all three had interesting shapes, but needed some color! One three-sided vase I chose to wrap with twine, hot gluing along the way to secure. The other two vases, I painted, using the technique found here of painting the inside of the vase, instead of the outside. I painted one a bright turquoise, and the other I used a sunny yellow. Craft weekend = a success! !